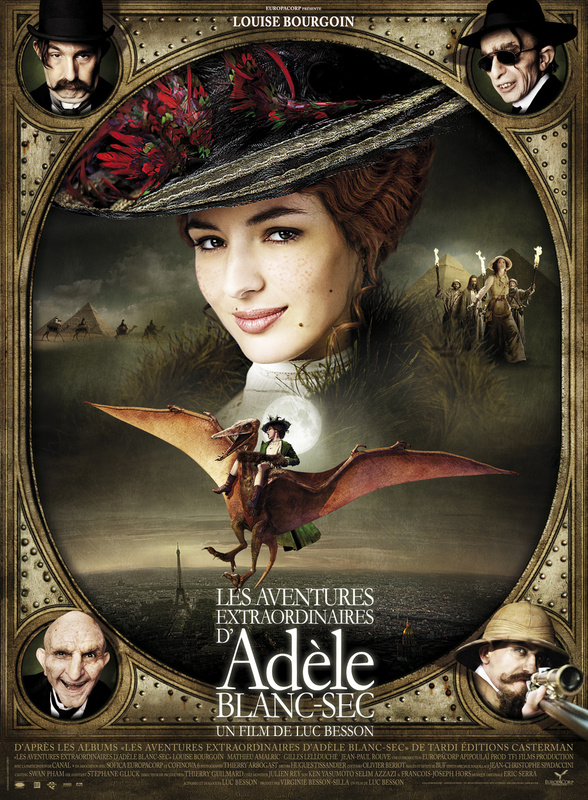 I guess, in the great scheme of appalling Luc Besson films, LES AVENTURES EXTRAORDINAIRES D’ADELE BLANC-SEC is pretty inoffensive — great swathes of it are even good fun. 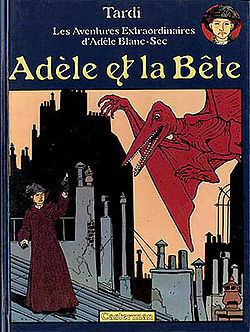 Any movie turning a pterodactyl and an Egyptian mummy loose in Belle Epoque Paris had better be fun, if it’s going to be anything. It’s even the same aspect ratio as Besson’s film. Tardi’s titles, as well as his stories, are shorter. Why, given all that’s in the movie’s favour, do I still find it intensely annoying? Maybe because Besson is so lazy — anyone can fold together a bunch of bande dessinees, if he doesn’t care about logic or structure. Everybody else has worked extremely hard to make this film as handsome as it is, but Besson’s contribution to the script feels like it probably took him a week. Furthermore, he still has that dreadful habit of encouraging his actors to do comedy double-takes at the end of scenes, which would be fine if he’d actually bothered to insert anything comedic for them to react to. Still, it beats the comedy double-take enacted in THE MESSENGER, where two English soldiers exchange a comedy glance when invited to participate in the violation of Joan of Arc’s sister’s corpse. That may be the precise moment Besson condemned his immortal soul to Hell, without possibility of reprieve. There IS a lot of comedy in the film, some of it funny (genuinely terrific joke about the Louvre), some of it laborious or grotesque. An endless sequence of the heroine trying to bust a mad scientist out of jail fizzles out, having occupied our protagonist for much of the film’s “second act” — the time would have been more entertainingly spent watching her shop for her disguises at the boutique of M. Hubert Balls. I’ve just been looking at Andre Hunebelle’s deplorable sixties FANTOMAS films, and they make the same mistake of making the detective a moron, to show off how hip and cool they are — despite the fact that this makes his role in the story useless, a tiresome drag on the narrative progress which would be immeasurably faster and more entertaining with a smart man pushing it ahead. But Besson doesn’t do smart. As some kind of substitute for wit, he serves up the expected accelerated-motion vooshes through CG fotoscapes, and bullet-time slomo when, with plodding literality, a bullet is fired. Well, “cliché” is a French word. It’s not clear to me why, with the whole world to play with, Besson had Adele traipse to Egypt, thus reprising chunks of RAIDERS OF THE LOST ARK and his own THE FIFTH ELEMENT, but I will admit to being charmed by his mummies, authentically skinny, leathery specimens taking good advantage of the possibilities of CGI. The Spielberg connection is deepened by his habit of plastering his male actors in prosthetics to turn them into grotesquely veined and liver-spotted, over-detailed versions of Tardi caricatures. This is what Spielberg’s TINTIN is going to look like, only burped out of a computer instead of a latex mould, complete with the four endings, each worse than the one before. There’s enough going on here, some of it amusing, for you to get some pleasure if you’re habitually less irritated by Besson than I am — for instance, if you like the capering in THE FIFTH ELEMENT and don’t mind it stealing the ending of MOONRAKER (FFS), you’ll probably have a ball. Something about the anti-Bresson just gets on my wick, is all. “Wonderful package for fans of the film and Dassin – along with the Masters of Cinema Antonioni packages this is one of the best Blu-rays to come out of the UK so far this year. Absolutely recommended!” ~ DVD Beaver. 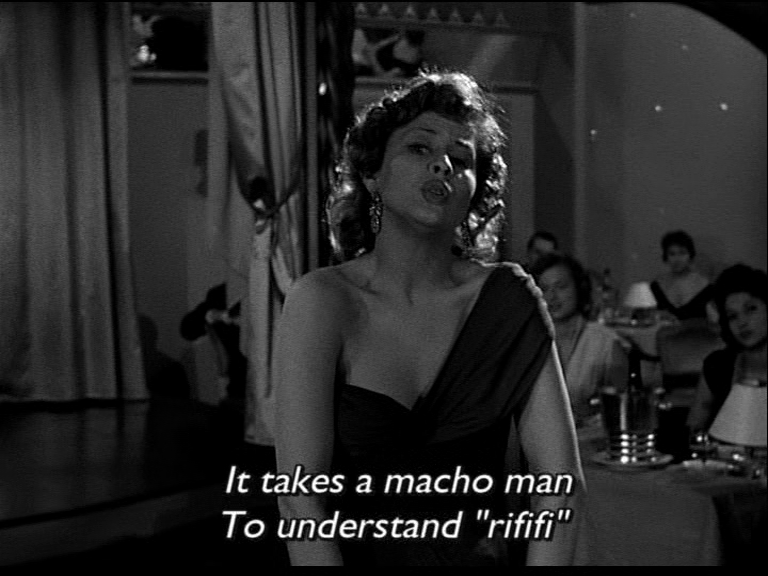 Jules Dassin’s RIFIFI comes out in BluRay and dual format editions from Arrow Films on May 9th, and with an original essay by me — which puts me in the company of Francois Truffaut, Alistair Phillips and John Trevelyan, whose writings on the film are extracted within the same booklet. 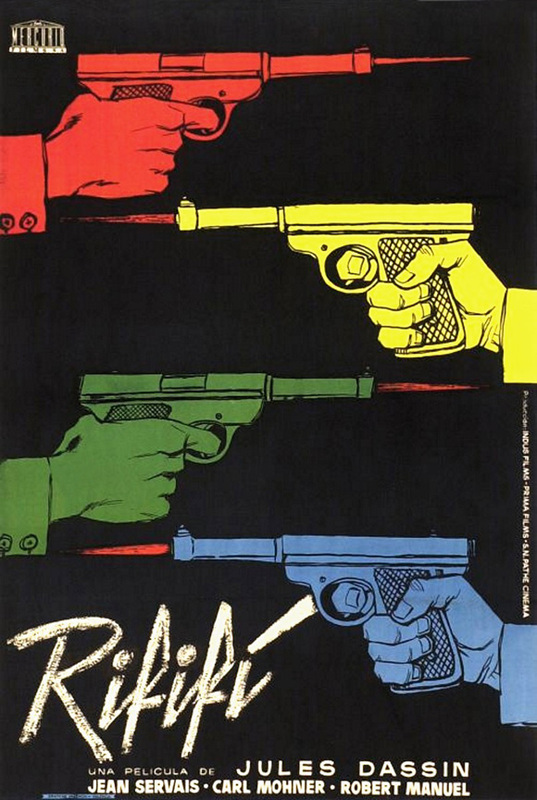 This one was a pleasure and a challenge to write about: I love Dassin, and had the opportunity to relate RIFIFI to his other work in a way that’s rarely done. Too often it’s taken for granted that his lesser-known films aren’t any good, and that consequently there’s nothing to be learned from comparing them with his hits, neither of which assumption is true. I wouldn’t make any great claims for CIRCLE OF TWO, but the rest are of value. Image from THE WOMAN WITH A HUNDRED HEADS, Eric Duvivier’s film of Max Ernst’s collage-book, and the subject of this week’s edition of The Forgotten over at The Daily Notebook. Comment there, or here. Eric is the nephew of Julien, and you could treat this as a wacky foretaste of JULIEN DUVIVIER WEEK, which I still insist is definitely happening here, I’m just not entirely sure when.